Wargame: European Escalation is a technically accomplished and challenging strategy game that will definitely appeal to hardened strategy gamers. But it could be a bit daunting for less experienced players. The game is set in Europe during the period 1975 to 1985, when the Cold War was still very much alive and kicking. 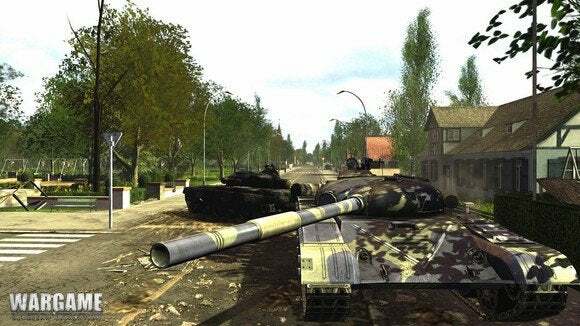 It presents you with a what-if scenario in which a minor skirmish on the border between East and West Germany escalates into all-out war between the Western forces of NATO and the Russian-led Warsaw Pact. It’s an intriguing set-up, and the fact that it’s set only a few decades in the past allows the developers to use real news footage to set the scene and create an atmosphere of tension at the start of the game’s 22 missions. However, you are thrown into the action with very little help. The game does include a Skirmish mode where you can practice against the computer in small battles, but there’s no real tutorial to help you get started and we quickly found ourselves stumped by even simple tasks, such as troop selection and movement. It helps to use a two-button mouse with a scrolling wheel. I was able to play with an Apple Magic Mouse after changing some of the Mouse settings in System Preferences, but a trackpad just felt clumsy. It’s worth getting a hold of a USB mouse if you can. Even then, the lack of a tutorial and the unhelpful manual mean that it will take some time to figure out how everything works. But if you can persevere through the first hour or so then you’ll find European Escalation to be a really engaging strategy game. The 3D graphics aren’t exactly state of the art, but they’re realistic and detailed enough to draw you into the action. The game also has one particularly impressive feature that it calls Iriszoom, which allows you to continuously zoom in or out using the scroll wheel on your mouse. When you’re planning your next move you can zoom out to get an overhead map view of the surrounding countryside. This will allow you to plan your strategy and take into account features of the terrain, such as a forest that might provide cover for your ground troops. Then, with the flick of your mouse button, you can smoothly zoom in on the action, skimming over the treetops or going right down to ground level with your troops. This ability to zoom into the action so quickly helps to create a real sense of involvement that will keep you engaged throughout the single-player campaign. And, as you complete each mission, you also gain Command Points that count towards your ranking when you go online for the multiplayer mode. Experienced strategy players will enjoy the game’s sense of immersion and the almost-contemporary setting that gives you a view of a Europe that might have been.